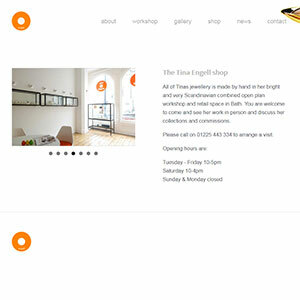 Tina Engell is an established goldsmith based in Bath. Design and development and slideshow building for the gallery. "I wanted a website that was clear, sharp and simple. Fatgraphics came to my shop – and they immediately understood my needs with regards to a functional website. They got it right the first time around, and I have had no need to tweak or discuss the layout. They are very professional, creative and dynamic to work with. Thank you Fat Graphics. "